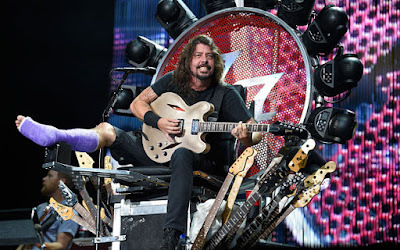 MetalRockNews: Foo Fighters' Dave Grohl reveals his own therapy for the broken leg: "Air drumming to Led Zeppelin three times a day"
Foo Fighters' Dave Grohl reveals his own therapy for the broken leg: "Air drumming to Led Zeppelin three times a day"
Foo Fighters' Dave Grohl said to Q magazine that he is doing his own physical therapy for his broken leg along with what the doctors ordered: "Ever since I started playing the drums, my right calf muscle has been twice the size of my left from stomping the hell out of my kick drum pedal. Now it looks like a sad little chicken wing, so I've been doing a little bit of my own rehab therapy lately, which is air drumming along to Led Zeppelin three times a day." Grohl said he is not doing during his recovery is writing any new songs. "Gus, our tour manager, said, 'Did you want me to put your guitar in the room with you?' I was like, 'Yeah, sure.' And I sat there staring at it like, that's the last thing I want to do right now. If I were to write a record right now, it would be a frustrated, depressing mess. No way! I want to write songs that make people boogie, I couldn't even walk! So no, I have not hit some creative stride."